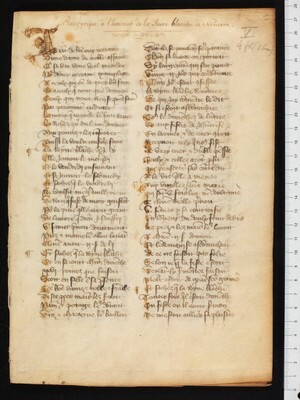 Fragment of a panegyric on Queen Blanche of Navarre (1331–1398), consisting of almost 400 verses. The author Robin Comtet - who mentions himself toward the end of the piece - is not otherwise known. The poem seems to have been preserved only in this copy and has not yet been published.